We’re exceedingly happy to announce that the most recent issue of the Devil’s Artisan, Number 79, is now available, and it’s a beaut. Inside you’ll read Jaleen Grove’s exploration of the work of illustrator Oscar Cahén, whose avant-garde works were intended to stimulate fascination–and even horror!–and ended up affecting the aesthetic of Canadian design in the 1940s and 50s. You’ll also find an illuminating chat with Rod McDonald on the development of his font family Classic Grotesque. 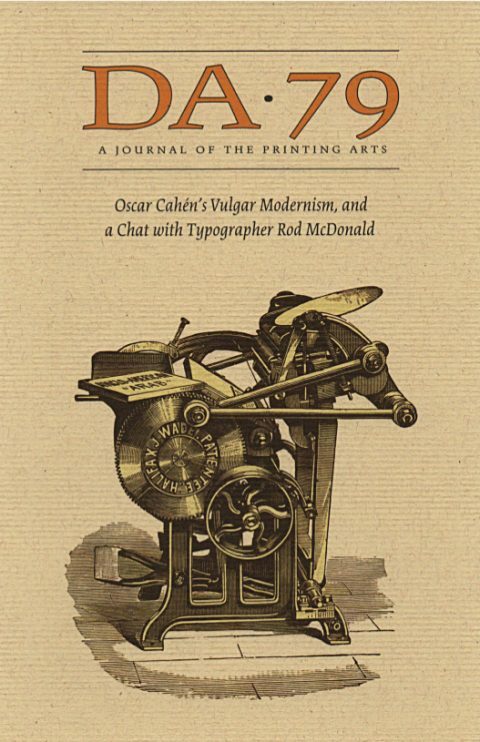 Plus, we’ve got pieces about the Howard Iron Works and the Barbarian Press. There is definitely a lot to learn–and a lot to love. Single issue orders can be placed here. If you have a yearly subscription, rest assured that your copy will be on its way early in the new year. Have a wonderful holiday from all of us from the Porcupine’s Quill and the Devil’s Artisan. This entry was posted in Posts and tagged Barbarian Press, DA 79, Howard Iron Works, Oscar Cahen, Rod McDonald. Bookmark the permalink.